00:00.078: INFO: iexplore.exe version check success. Install can proceed. 00:00.093: INFO: Trying to extract ID: SetupDownloadList.txt (0) as "SetupDownloadList.txt"
00:00.093: INFO: Trying to extract ID: HardwareBlockingList.xml (0) as "HardwareBlockingList.xml"
00:00.109: INFO: Trying to extract ID: 7006 (0) as "IE11-neutral.Extracted.cab"
00:00.889: INFO: Trying to extract ID: 7010 (2052) as "IE11_amd64_zh-CN.cab"
00:00.905: INFO: Extracted zh-CN language pack to C:\Windows\TEMP\IE11F81.tmp\IE11_amd64_zh-CN.cab. 00:00.905: INFO: Trying to extract ID: 5501 (1033) as "Spelling_en.msu"
00:00.905: INFO: Extracted Spelling dictionary for en to C:\Windows\TEMP\IE11F81.tmp\Spelling_en.msu. 00:00.905: INFO: Trying to extract ID: 5502 (1033) as "Hyphenation_en.msu"
00:00.936: INFO: Extracted Hyphenation dictionary for en to C:\Windows\TEMP\IE11F81.tmp\Hyphenation_en.msu. 00:00.936: INFO: Trying to extract ID: 7128 (2052) as "IE11-support.cab"
00:01.497: INFO: PauseOrResumeAUThread: Successfully paused Automatic Updates. 00:03.354: INFO: Updated Download list, Hardware Blocking list, and no reboot policy files successfully downloaded and extracted for use. 00:03.385: INFO: Launched program to check hardware: "C:\Windows\TEMP\IE11F81.tmp\IE11-SUPPORT\IEXPLORE.EXE" /CheckHardware "C:\Windows\TEMP\IE11F81.tmp\IE11-support\HardwareBlockingList.xml"
00:03.432: INFO: Hardware support check succeeded. Installation will continue. 00:03.432: INFO: Windows 7 operating system detected. 00:03.463: INFO: Checking for correct version of C:\Windows\Fonts\segoeui.ttf. 00:09.485: INFO: Waiting for 0 prerequisite downloads. 02:11.774: INFO: The neutral pack was successfully downloaded from the internet. Installation will continue using the downloaded package. 02:11.789: INFO: Waiting for 0 language pack downloads. 02:11.789: INFO: Language pack downloads completed. (exit code = 0xffffffff (4294967295)). 02:11.805: INFO: No reboot logic message NrApiStart(0), lParam=0x005115c8 returned 0x00000000. 02:12.086: INFO: No reboot logic message NrApiScan(1), lParam=0x00000001 returned 0x00000000. 02:12.086: INFO: No reboot logic message NrApiStartInstall(4), lParam=0x00000001 returned 0x00000014. 02:28.622: INFO: Setting registry to check if Internet Explorer is the default browser on first run: SUCCESS. 02:47.498: INFO: No reboot logic message NrApiInstallDone(7), lParam=0x00000bc2 returned 0x00000000. 02:47.498: INFO: No reboot logic message NrApiStartFinish(11), lParam=0x00000000 returned 0x00000000. 02:47.498: INFO: No reboot logic message NrApiFinish(12), lParam=0x00000000 returned 0x00000016. 02:47.498: INFO: Verifying that the Internet Explorer Optional Component is enabled. 02:52.225: INFO: PauseOrResumeAUThread: Successfully resumed Automatic Updates. 02:52.241: INFO: Setup exit code: 0x00000BC2 (3010) - Installation Succeeded. Reboot required. 02:57.295: INFO: Unable to remove directory C:\Windows\TEMP\IE11F81.tmp, marking for deletion on reboot. 02:40.338: INFO: Setup exit code: 0x00000BC2 (3010) - Installation Succeeded. Reboot required. 00:00.047: INFO: iexplore.exe version check success. Install can proceed. 00:00.047: INFO: Trying to extract ID: SetupDownloadList.txt (0) as "SetupDownloadList.txt"
00:00.062: INFO: Trying to extract ID: HardwareBlockingList.xml (0) as "HardwareBlockingList.xml"
00:00.062: INFO: Trying to extract ID: 7006 (0) as "IE11-neutral.Extracted.cab"
00:00.827: INFO: Trying to extract ID: 7010 (2052) as "IE11_amd64_zh-CN.cab"
00:00.827: INFO: Extracted zh-CN language pack to C:\Windows\TEMP\IE12BD0.tmp\IE11_amd64_zh-CN.cab. 00:00.827: INFO: Trying to extract ID: 5501 (1033) as "Spelling_en.msu"
00:00.827: INFO: Extracted Spelling dictionary for en to C:\Windows\TEMP\IE12BD0.tmp\Spelling_en.msu. 00:00.827: INFO: Trying to extract ID: 5502 (1033) as "Hyphenation_en.msu"
00:00.842: INFO: Extracted Hyphenation dictionary for en to C:\Windows\TEMP\IE12BD0.tmp\Hyphenation_en.msu. 00:00.842: INFO: Trying to extract ID: 7128 (2052) as "IE11-support.cab"
00:01.295: INFO: PauseOrResumeAUThread: Successfully paused Automatic Updates. 00:02.012: INFO: Updated Download list, Hardware Blocking list, and no reboot policy files successfully downloaded and extracted for use. 00:02.028: INFO: Launched program to check hardware: "C:\Windows\TEMP\IE12BD0.tmp\IE11-SUPPORT\IEXPLORE.EXE" /CheckHardware "C:\Windows\TEMP\IE12BD0.tmp\IE11-support\HardwareBlockingList.xml"
00:02.090: INFO: Hardware support check succeeded. Installation will continue. 00:02.090: INFO: Windows 7 operating system detected. 00:02.137: INFO: Checking for correct version of C:\Windows\Fonts\segoeui.ttf. 00:08.034: INFO: Waiting for 0 prerequisite downloads. 01:36.315: INFO: The neutral pack was successfully downloaded from the internet. Installation will continue using the downloaded package. 01:36.330: INFO: Waiting for 0 language pack downloads. 01:36.346: INFO: Language pack downloads completed. (exit code = 0xffffffff (4294967295)). 01:36.346: INFO: No reboot logic message NrApiStart(0), lParam=0x003e15c8 returned 0x00000000. 01:36.580: INFO: No reboot logic message NrApiScan(1), lParam=0x00000001 returned 0x00000000. 01:36.596: INFO: No reboot logic message NrApiStartInstall(4), lParam=0x00000001 returned 0x00000014. 01:51.665: INFO: Setting registry to check if Internet Explorer is the default browser on first run: SUCCESS. 02:10.744: INFO: No reboot logic message NrApiInstallDone(7), lParam=0x00000bc2 returned 0x00000000. 02:10.744: INFO: No reboot logic message NrApiStartFinish(11), lParam=0x00000000 returned 0x00000000. 02:10.744: INFO: No reboot logic message NrApiFinish(12), lParam=0x00000000 returned 0x00000016. 02:10.744: INFO: Verifying that the Internet Explorer Optional Component is enabled. 02:40.338: INFO: PauseOrResumeAUThread: Successfully resumed Automatic Updates. 02:45.408: INFO: Unable to remove directory C:\Windows\TEMP\IE12BD0.tmp, marking for deletion on reboot. 00:00.015: INFO: iexplore.exe version check success. Install can proceed. 00:00.015: INFO: Trying to extract ID: SetupDownloadList.txt (0) as "SetupDownloadList.txt"
00:00.015: INFO: Trying to extract ID: HardwareBlockingList.xml (0) as "HardwareBlockingList.xml"
00:00.031: INFO: Trying to extract ID: 7006 (0) as "IE11-neutral.Extracted.cab"
00:00.577: INFO: Trying to extract ID: 7010 (2052) as "IE11_amd64_zh-CN.cab"
00:00.577: INFO: Extracted zh-CN language pack to C:\Windows\TEMP\IE1B97F.tmp\IE11_amd64_zh-CN.cab. 00:00.577: INFO: Trying to extract ID: 5501 (1033) as "Spelling_en.msu"
00:00.577: INFO: Extracted Spelling dictionary for en to C:\Windows\TEMP\IE1B97F.tmp\Spelling_en.msu. 00:00.577: INFO: Trying to extract ID: 5502 (1033) as "Hyphenation_en.msu"
00:00.577: INFO: Extracted Hyphenation dictionary for en to C:\Windows\TEMP\IE1B97F.tmp\Hyphenation_en.msu. 00:00.592: INFO: Trying to extract ID: 7128 (2052) as "IE11-support.cab"
00:03.057: INFO: Updated Download list, Hardware Blocking list, and no reboot policy files successfully downloaded and extracted for use. 00:03.057: INFO: Launched program to check hardware: "C:\Windows\TEMP\IE1B97F.tmp\IE11-SUPPORT\IEXPLORE.EXE" /CheckHardware "C:\Windows\TEMP\IE1B97F.tmp\IE11-support\HardwareBlockingList.xml"
00:03.198: INFO: Hardware support check succeeded. Installation will continue. 00:03.198: INFO: Windows 7 operating system detected. 00:03.213: INFO: Checking for correct version of C:\Windows\Fonts\segoeui.ttf. 00:06.786: INFO: Download for KB2888049 initiated. 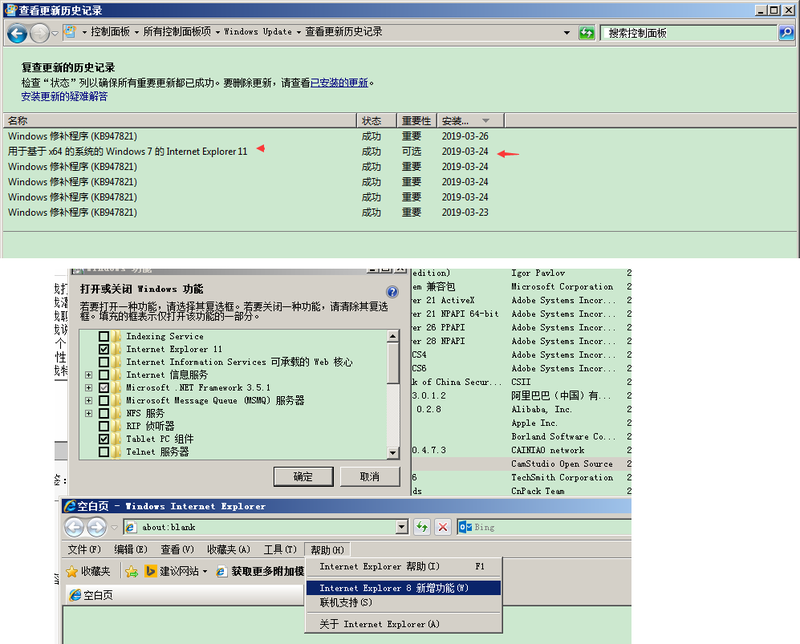 Downloading http://go.microsoft.com/fwlink/?LinkID=324542 ;-> KB2888049_amd64.MSU. 00:06.817: INFO: Download for KB2882822 initiated. Downloading http://go.microsoft.com/fwlink/?LinkID=324541 ;-> KB2882822_amd64.MSU. 00:06.848: INFO: Waiting for 2 prerequisite downloads. 00:36.395: INFO: Prerequisite download processes have completed. Starting Installation of 2 prerequisites. 01:54.473: INFO: The neutral pack was successfully downloaded from the internet. Installation will continue using the downloaded package. 01:54.489: INFO: Waiting for 0 language pack downloads. 01:54.504: INFO: Language pack downloads completed. (exit code = 0xffffffff (4294967295)). 01:54.536: INFO: No reboot logic message NrApiStart(0), lParam=0x005028c8 returned 0x00000000. 01:54.910: INFO: No reboot logic message NrApiScan(1), lParam=0x00000001 returned 0x00000000. 01:54.926: INFO: No reboot logic message NrApiStartInstall(4), lParam=0x00000001 returned 0x00000014. 02:32.350: INFO: Setting registry to check if Internet Explorer is the default browser on first run: SUCCESS. 03:44.298: INFO: No reboot logic message NrApiInstallDone(7), lParam=0x00000bc2 returned 0x00000000. 03:44.313: INFO: No reboot logic message NrApiStartFinish(11), lParam=0x00000000 returned 0x00000000. 03:44.313: INFO: No reboot logic message NrApiFinish(12), lParam=0x00000000 returned 0x00000016. 03:44.313: INFO: Verifying that the Internet Explorer Optional Component is enabled. 05:36.322: INFO: Setup exit code: 0x00000BC2 (3010) - Installation Succeeded. Reboot required. 05:36.416: INFO: Unable to remove directory C:\Windows\TEMP\IE1B97F.tmp, marking for deletion on reboot. 我把 IE临时文件夹改成英文的，还是不行。感觉和这个关系不大，因为前面的步骤，已经Setup exit code: 0x00000BC2 (3010) - Installation Succeeded. Reboot required. 16楼： 00:00.015: Command line: "H:\Windows\win7x64\IE11-Windows6.1-x64-zh-cn.exe"